Because everyone is going to need a little de-stressing once the holiday season is over…think…. I am giving away SIX 1 year subscriptions to Martha Stewart’s, Whole Living body + soul magazine….you are guaranteed to feel relaxed and restored once it hits your mailbox!!! Winner must have a United States address to receive the magazine. Contest ends, Saturday, November 27th at 10 PM (Pacific Time)…winner announced the next day. A glass of wine and a book! A weekend at a beachhouse filled with friends, family, food, and f….fun times. As a very busy college student time to relax is hard to find. However I find a good Audrey Hepburn movie and a new knitting project to be my favorite way to de-stress. Zumba. It’s intense dance exercise, burns up to 800 calories and without this at least 3-4 times a week, I’m a bit cranky. A hot bath, some candles, soft music, a glass of Northwest wine and a good book. Heaven, absolute heaven! My favorite way to de-stress is to dim the lights, cuddle on the couch and watch Criminal Minds. 🙂 LOVE that show! Yoga works wonders for me. If it’s summer, I walk the Burke Gilman Trail. If it’s winter, I make cocoa an watch some TV. My favorite way to distress is a glass of wine and a very, very bad movie. A hot bath in silence. A window seat on my train home, a snuggle with my dog, and a little time with my knitting fixes everything that breaks. Definitely relaxing by doing some yoga — my new hobby! A cup of hot tea and a good book or my cross-stitch. A great massage followed by a glass of wine…I know I should drink water after a massage but wine tastes so much better! I put a few drops of sesame oil into a mildly hot bath, close my eyes and meditate. My favorite way to destress is to sit out on the rocks at my favorite cove in Maine and close my eyes and let the sounds of everything around me, sink in. It doesn’t matter what’s bothering me, there is nothing that the sweet-salty perfume of the ocean, the song the wind sings to the waves below or the rapport between the crashing surf and the sand, can’t undue in my life. My favorite way to de-stress is baking or cooking. Just being in the kitchen in general is my comfortable place! A hot shower, a cocktail and a good book. Walk, knit, walk, read, walk, repeat as needed. … when I look back, I think about the many sad and bad decisions – things – that have happened to me – and then I list the good things that came of these that I did not realize – kids, values, possessions, friends and experiences. I take 10 deep breaths and realize that experiences – bad and good – give us what we really value. My favorite way to de-stress is exercise and a hot shower. I love cuddling in bed w/ my dog Max and I also love a hot hot bath w/ the headphones on playing something acoustic with the lights off. My best way of destressing is tea and a long car ride with my kids. Reading a good book while snuggling under my down comforter! A long soak in a hot tub! Sitting at the computer is my destresser. My favorite way to destress is to bake something or craft something. Creating something new makes me feel like all is right with the world again 🙂 Naps help too, of course! My favorie way to destress is to load some classical cds in the player, brew a cup of hot tea, load a classic book into my Kindle, light a candle and read. Favorite way to de-stress is to not have kids buggin’ and try to catch up on blogs and Facebook. Playing computer games, taking the dog for a long walk and/or doing something electrical around the house. Putting in my iPod and going for a walk. Works every time. Quiet time with my dog. I go to the beach, put the iPod on (Al Green), bury my feet in the sand, and just sit there, watching the waves until I calm down. I love taking a long shower to destress! I de-stress by looking at what has gone right, and noting it. Then, when dealing with what has not gone so well and also, at what is in the process of I find that I am better able to be see from a calmer, more centered note. Taking my son to ride his horse while I watch & knit. I love, love, loveee doing yoga to de-stress. It is an absolute life saver and such a beautiful art. Doing shao lin king fu! Favorite way to de-stress is a nice comforting bubble bath and spending time with my cats. All I need to do is sit and pick up my current knitting project and I am in a whole other place, all pressure disappears. Run 5 Miles… or take a hot tub. A glass of wine and a bit of quiet helps. With two sons, it’s the quiet that is hard to come by. working on a project at home….painting, fixing, renovating….the focus required allows me to forget about everything else going on in my life and the feeling of satisfaction when it’s done brings peace…..
For me its to get online and chat with friends. If everything is cleaned up and the whole family is home, I feel most peaceful reading in the sunroom. I feel peace at night when all is still and calm when the crazy farm is put to bed. Destress? Breathe in, breathe out all the while sipping on a tasty cup of flavored coffee. Ahhh, sorrt of like a Folgers moment. Thanks for the great give away opportunity! My favorite way to de-stress is to make myself a tall glass of ice tea and sit out on our deck on a lounge chair, listening to the birds chirping and looking out at the tall trees. It’s lovely! I enjoy running, it totally relaxes me…that doesn’t sound right, but it’s true. De-stressing let me count the ways…taking my vintage fountain pen and writing a “real” letter. Bubble bath, good book, a glass of wine. All at the same time. Rinse, repeat. I make a batch of chocolate body scrub and pumpkin face mask and pamper myself in a hot bath. That way I get to both cook AND have a fabulous natural spa night in one go. Reading to my Raine and Ransome. Wine seems to always do the trick! Along with an early bedtime for my 2 year old! I live in the perfect place to de-stress. A daily morning walk on the beach does wonders and keeps me from getting stressed out. It is the perfect spot to meditate also. It is the perfect place to just “be”. Lighting some candles, finding a quiet place, and reading a book. a brisk walk and then snuggling in with a cup of tea and a good book! My best way is a nice warm bath in my whirlpool tub. Lots of bubbles, some candles, and white wine. I destress by snuggling up with my pets and a good book. Getting lost in a good book is a wonderful way to let go of my worries. Going to the grocery store, alone, and wandering the aisles. baking. my friends laugh at me for this; they say baking would stress them out more. but when i’m truly stressed out, can’t think straight stressed out, would like to sit on the floor and cry stressed out– baking is about the only thing that will put my world back in order. I destress with simple knitting..certainly not lace knitting, and a small snifter of brandy in the evening. Sitting in the dark mindlessly looking out the window while drinking a cup of hot chocolate with whipped cream. to destress, i really enjoy running/exercising, baking, or doing the dishes. A good book is the best de-stress-er for me, along with a nice glass of wine. Thats’ very generous of you Cathy! 🙂 I like a nice hot bath with candles to de-stress. Been a long time since I did that! I like to put on a silly movie and pull out some knitting. You know, I think I’ll do that today! My favorite way to de-stress is to NOT be at work..ha! Crackling candle (Wood Wicks), quiet room, light from lamp, on the couch with a good book and cozy blanket. Ahhh. Listening to music in my bed. A nice hot bath or shower….that usually does the trick. A nice long walk or reading a book does it for me. Cup of tea and a favorite book I’ve read before. My favorite way to de-stress is to have a cup of hot tea or coco and watch a good movie. I am in college and the best way for me to de-stress is to watch some glee and bake. my favorite is to make cinnamon rolls! Favorite way to destress is with a glass of wine or two. to destress = pull out my watercolour paints and turn on my iPod. I’ve gotten where making something in the kitchen really helps with stress. It amuses me, as I never thought that would happen! Stress? What stress? Reality Check! For me, a long hot soak in the tub with a lovely glass of wine and a wonderful book does wonders! Stress? What stress? My favorite way to destress is to bake or cook. Bread, cookies, I made beef stock when I had a lot of homework one time. When I have insomnia I make cinnamon buns and clean the kitchen. My best way to destress is to listen to the ocean, but of course that would require me going on a vacation to the Oregon coast, which I love! Going for a long run really helps me get my stress out. Read…books and food blogs are great ways to leave the stress behind. a long bath with a book has been my go to relaxation plan for years =o) add a glass of wine to the mix and its even better! I love going for long runs! Definitely a great destressor. My favorite way to destress is to take a walk on the beach and look for beach glass. I have a whole jar of it on my counter and just the sight of it calms me down. My fave way to de-stress is sipping a nice cup of tea and reading a book! Baking for sure…you can always find me in the kitchen at about 10pm the night before a big test!! A Manhattan with 2 cherries and some Cole Porter playing. Knitting and a cup of cocoa. Once I’ve calmed down a bit, I’ll bake. A walk with my 2 babies if I’m stressed in the day. A glass of wine and book at night, or a pedicure and massage if I have a sitter! A glass of wine and the crossword puzzle…. bliss! Every day after getting home from work ( I am a forensic technician and the work is not always uplifiting) I look forward to walking my 2 dogs. Neither rain , hail, sleet, snow or these early dark evenings deter us and there is always such joy with them that I totally de-stress. A long walk, bath with music, get in my comfy cozy robe, sit in my big leather chair and read a magazine with a glass of wine. A good book and the kids out of the house! I treat myself to a massage each month! The best destresser for me is to sit down at the piano and play some of my favorite pieces. It calms me right down and clears my head. I love to pour a nice glass of pinot grigio and cook. A new recipe and quite time in the kitchen is my way to de-stress after a long day! I cross-stitch and listen to audiobooks. Long hard run, followed by a rewarding meal and some wine! A run, followed by a shower with Dr. Bronner’s Peppermint Castile soap, and a cappuccino! 6 hours of tailgating before a USC football game. Listening to music on my IPOD – either relaxing with a glass of wine or pumped up and dancing in my living room. I usually like to read to relax, and nothing beats a good Zumba class to make you forget your worries! clean out my dvr, watching my favorite shows when i want! Just a good ol’ fashioned hot bubble bath, always works wonders! TEA TEA TEA and then some yoga. My favorite way to de-stress is a cup of tea and some quiet time reading while cuddled up on the couch. Cleaning while listening to my favorite music, showtunes! Cleaning always helps me de-stress! Favorite way to de-stress? Yoga – hot or cold…. My favorite way to destress–if possible, take a ballet class–it’s a guaranteed thing that the barre work will take me out of “my own stuff” and help me to center! Or–visiting and laughing with friends–always a good source of destressing! I drink a bottle of wine. Works every time. a cup of tea, a cat on my lap, and a book. I like to take a hot bath with a glass (or 4) of wine. I love to read either with a nice glass of wine or my carmel vanilla cream coffee! Volunteering whether at the local shelter or visiting and helping elderly folks that have no family really is a great way to destress. Brings a calm just helping others that cant be matched. I tend to eat something sweet when I’m stressed…or go shopping. We live just a mile from the beach and rarely go there…to destress, I take a walk along the deserted beach and listen to the ocean roar. Pour a glass of wine, turn on jazz, and cook! Naps are the way to go!! The gym, by far. Nothing better than working off a sweat to de-stress! A long run preferably in cold weather with David Gray on my iPod! Works every time. A workout followed by a delicious warm shower always resets me when I am stressing out. To de-stress I put on comfy clothes, read a book, and have a glass or two or wine! Cooking in my wonderful kitchen… with a LARGE glass of wine! I listen to favorite music while enjoying a glass of wine (I see a wine trend here!). I also find it very relaxing to cook. I love to swing… on a swingset… until my head is clear. My favorite way to de-stress is to enjoy a glass of wine while sitting in my HUGE comfy recliner… with the soft sounds of my DD and DH snoring in their respective beds! A 90 minute yoga class with my favorite teacher! Chocolate! Is there another way??? 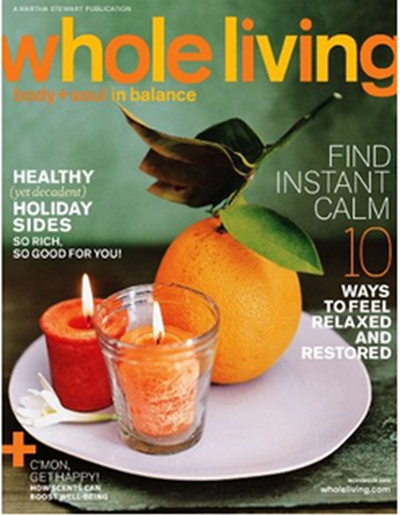 If I knew how to relax, I wouldn’t NEED Whole Living body & soul magazine. When stress hits hard, I take a long walk in the woods. The dogs love it, and I come home much destressed. A cup of coffee and a good book in a hot bath…I think I’ll go do that right now! Being a single mother going to school full time to become a nurse, I have discovered that the best ways to relax are my son’s arms around my neck. No matter how stressed I am over a paper, a test, or what to do with a patient, after a few rounds of singing together or going for a walk together I feel like I can accomplish anything again! Glass of Noble Pig, good book, channel 27 on XM and a roaring fire. I curl up with a glass of wine in front of the fire and read. Oddly enough, chopping vegetables is my way of de-stressing….the whole process of washing & carefully cutting the veg makes me feel at peace. Reading a good book, preferably a mystery, is a great way to de-stress. A drive in the mountains with some nice smooth jazz. A cup of tea, a blanket, a fire and a good read. Ahhh…Thanks for the giveaway. I de-stress with a long, hot shower. And if it was a particularly stressful day I will reward myself with some a giant meal! Comfort food soothes my soul! Yoga is my favorite de-stress activity. Plus it’s a great morning workout! Love it! A long, warm bath and shampoo helps me calm away stress. Hot bath and glass of wine! Believe it or not I have 5 cats and combing them and grooming them changes my feelings of stress. It must be because two in particular just love being combed and their happiness seems to relax me. When I’m feeling stressed, I go for a hike. The Montecito trails are my favorite, especially in the fall. A nice hot bath followed by a cup of hot cocoa! Sitting quietly with my dog by my side knitting prayer shawls for hospice patients is my way to relax and de-stress. Playing with my dog. Who can stress when you’re having that much fun? My destress time is to put on my favorite jammies, climb into my fresh made feather bed, and watch Martha Stewart on tv. Destressing is to sit in a big, cushy chair with a blanket, cup of tea and a book. If I could add an imaginary fireplace to me house, then there’d be a crackling fire as well! I like to do yoga, unless it’s really bad, and then I take a hot bubble bath and ignore the rest of the house. Reading does it for me! Taking my 15 month old son to the park! My favorite way to de-stress is after a nice warm shower, to curl up in my favorite chair in my jammies with a good book & read till I’m sleepy. I love a good massage. If I can’t get one squeezed in, I usually bake something! LOVE that i get to eat and enjoy what i have made. Sipping a glass of nice wine in front of the fire talking with my husband. A hot bath with a glass of wine! to de-stress i love to take baths! My fav way to de-stress is by sitting in my comfy chair with my kitten! A nice glass of wine and a great book! Best we to relax and de-stress! I destress with a good book and a glass of wine, preferably out on my patio swing. Favorite way to destress…………. to uncork a bottle of Pinot and let the rest of the world, just go on by!! Play with all seven Grand kids. Know now why they are called Grand. Making soup. All that chopping, stirring, seasoning, and tasting helps me forget whatever was bothering me. Hurray for leftover turkey soup! Play with all seven Grand Kids. I know now why they are called Grand. My favorite way to unwind is to talk a long walk or crochet.. does wonders..
My favorite way to de-stress is to start crafting my homemade gifts for Christmas. This year I’ll be making some jewelry and homemade totes. Still figuring out what to give the guys. A nice glass of milk and some cookies for dunking or a quiet room, fav TV show and a glass of wine. Vinyasa Flow Yoga! Its one full hour where my brain just stops and I can be purely in the moment. Beautiful! I love bikram (Aka hot yoga). Sweating it out detoxing and also relaxing your mind. Bikram is more exciting then other kinds of yoga but you still de-stress while doing something healthy and engaging! Take the dog for a walk! Then make a cup of tea, sit in my favorite chair with my needlepoint and watch a DVR’d show that I couldn’t watch! 🙂 My favorite way to de-stress is with a good book. Kick everyone out of the house and just read. Reading is my major de-stressor. Totally takes me away. My favorite way to de-stress is to Bake, usually something that requires icing..
For me, a hot shower before bed (something that’s not part of my normal routine) is something that I find SO de-stressing. A good book, long format historical fiction is my favorite, and a cup of tea. My favorite way to destress is to bake and drink a glass of wine while doing it! Getting to the gym! A good sweat never felt better. lighting candles, sitting in my over-sized armchair and reading a good book or magazine is my perfect way to de-stress! wine and a hot bath! Zumba is also great-if you’re in the mood to sweat! Go snowboarding – I can’t think about anything else while riding down the mountain. It’s good to have an activity where I can only focus on the thing I’m doing. A cup of hot tea, and depending on the season, a hot bubble bath. I bake…a lot! I tend to bake at least a couple times a week. I’m not sure why it helps me relieve stress, but it sure works! It may have to do with the feeling of accomplishment, more than anything. My favorite way to de-stress is to lose myself in a great book! I love to read, or often I will bake. I haven’t de-stressed in such a long time I’m really not sure what I would do. My favorite way to de-stress is to get regularly scheduled massages. I always look forward to my massage day. I leave feeling almost brand new. a big bubble bath & glass of wine!! An intense cardio class followed by a stretch yoga session is my favorite way to de-stress! I love to sit with a great book, a glass of wine or a cup of good coffee and my little cat, Sadie, by my side. I think her purring relaxes me the most! My favorite way to de-stress is to take a long walk…preferably alone to sort my thoughts. Or if I can’t stand to be alone with my thoughts, I like to just sit and vent to the hubs. I have soak up to my neck in bubbles and hot water in my wonderful bathtub. My favorite way to relax is working in my “happy room” aka my sewing room. Sewing, embroidering, etc. The contest is now closed. Any comment left after this one will not be considered. I love acupuncture. I don’t know if it’s the needles at work or just the down time but I always come out of a session so refreshed. Singing silly songs helps a bunch too.